After decades of state-controlled cultural and artistic production, the outbreak of the Syrian uprising triggered a need for self-expression that had been severely repressed. This translated not only into powerful canvases and other formal artistic works but also into less formal and traditional artistic expressions, or as the 'The Syrian People Know their Way' group calls it, “art out of the salons”. Works of graffiti, combative hip-hop and heavy metal beats, creative banners raised in demonstrations and countless other grassroots manifestations permeated the popular uprising. Here lies the main difference with the artistic renaissance that accompanied the Arab uprisings of the 50s and 60s. While those are referred to as the “revolutions from above”, deeply connected to the idea of pan-Arabism implemented by ruling elites, we are now witnessing a spontaneous and decentralized wave of cultural and artistic manifestations that do not respond to hierarchical organization, with youth playing a crucial role. Within this context, Kafranbel stands out as a paradigm of grassroots creative storytelling, offering a nuanced account of the past three years in Syria. The banners created by Kafranbel -- also spelt Kafr Nabl, and Kafr Nubl -- and widely shared through online social networks, can be read as episodes of a graphic novel, organized in sections that correspond to the different threats faced by the town, and the country as a whole: Occupied Kafranbel marks the siege of the town by the Syrian army: Liberated Kafranbel celebrates the army's withdrawal, Violated Kafranbel reflects on the threats posed by extremist groups such as Daesh (ISIS), before the town is once again Liberated as it manages to expel Daesh. Within this structure, shaped by events on the ground, each banner becomes a fragment in the mosaic composed, week by week, through powerful messages and cartoons. By following it, an interested onlooker can acquire a comprehensive picture that helps clarify the complex Syrian scenario, through a Syrian-made narrative. When the state-controlled narrative refers to demonstrators as “terrorists”, Kafranbel develops a storytelling that revolves around “revolutionaries” and “martyrs”. 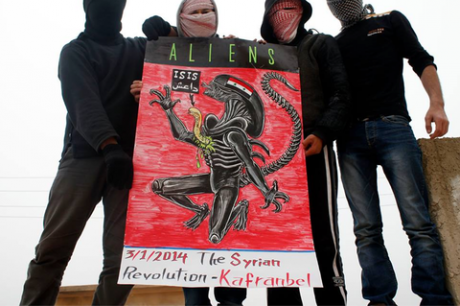 If official channels focus on the “international conspiracy against the country”, Kafranbel stresses the importance of the “uprising”, the “revolution”, and its popular demands. As the regime projects itself as the only guarantee against extremist groups, Kafranbel presents the Assad family and Daesh as two sides of the same coin. Official narrative becomes, for the first time in decades, contested by a grassroots, citizen-made, Syrian narrative that cannot be silenced, and so does mainstream international coverage of the country. 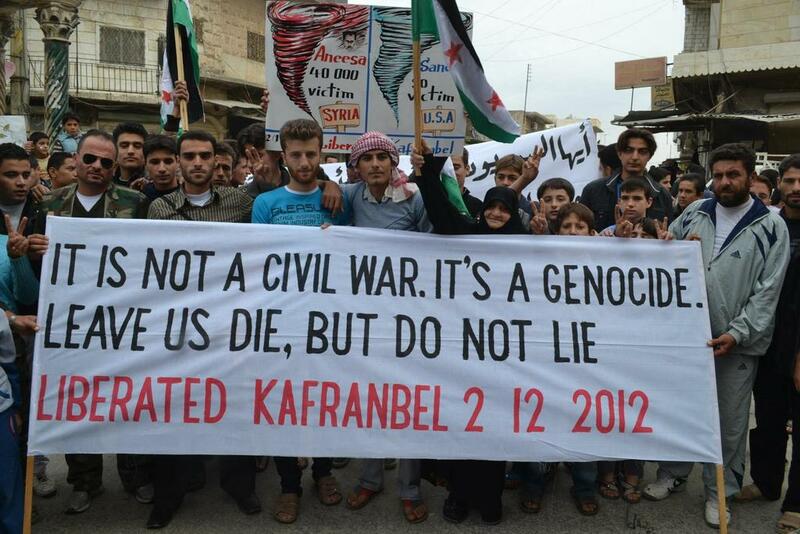 Kafranbel not only challenges state-controlled propaganda, but reductionism associated with a western view of the 'other', through banners reflecting on the role of the “international community” in disregarding popular demands and promoting impunity. Kafranbel is not only an example of Syrian resilience and the hunger for self-expression, but it also exemplifies the evolution of citizen storytelling within a changing and uncertain scenario. While the town has remained true to its essence, it has continued to experiment with different genres and formats, in order to increase and diversify its outreach. Video and theatre are but two examples. In a video entitled “The Syrian revolution in three minutes”, reactions of the international community to massacres perpetrated by the Syrian regime are parodied and ridiculed through a performance inspired by cavemen. In a world that tends to ignore grassroots projects and initiatives, Kafranbel shows awareness not only of Syria´s recent history, but of how the rest of the world views them, as stone age barbarians whose voice has become a nuisance. Others in the town also explore the combination of traditional and modern Syrian art, through projects such as “Panorama Kafranbel”, based on the antique art of mosaic, present in the Levant region for centuries. This craft, associated with aesthetic scenes of nature, animals and banquets, now serves a revolutionary message that challenges decades of censorship. A torn Syrian map that two hands are trying to sew, a child drawing a graffiti, four figures representing the embrace of four different religions, are some of the themes of these pieces in which Syrian artistic tradition is recovered and adapted to present needs and challenges. 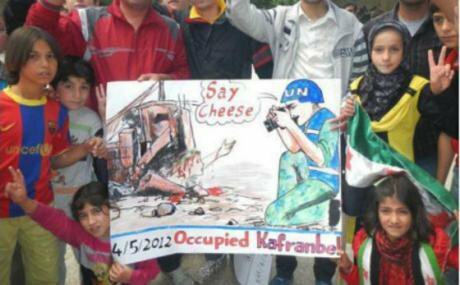 Today, tradition and innovation are powerfully exploited in Kafranbel’s storytelling. So is the combination of local and global, as the town’s banners present the specificity of the Syrian context through the universality of its struggle. In our next article for 'Looking inside the uprising', we will look into how the story told by this little Syrian town is a universal one, through the cultural icons and references used to tell Kafranbel’s stories.